Of course, it’s important to “be in the moment” when you’re on vacation — experiences aren’t fun experiences when you’re fussing about something and not seeing or hearing what’s around you. However, no vacations are 100 percent unforgettable; some details are sure to slip out of your memory, especially as time goes on. To help with this, make sure you think about important camera options while you’re packing for your Niagara vacation. This will ensure you come home with all the memories you made during your stay nice and secure. Read on for some Niagara Falls’ tips for photographers you can follow on your next trip to this stunning part of the world. As you’ve no doubt realized, being a waterfall (well, actually three of them combined), Niagara Falls is wet! So, as a result, with many of Niagara Falls’ activities taking place in or around the falls, your belongings are likely to get hit with some of the spray of the rushing water. If you have extremely delicate or costly photography equipment, you may want to either forgo bringing it with you in certain situations, or purchase some protective coverings for it. If you’re considering taking a boat ride to get up close to the falls so you get a wonderful vantage point for photos, you might be wondering, how wet do you get on the Maid of the Mist boat ride? The fact is, you can get quite wet. While the tour company does provide each ticket holder with a complimentary hooded rain poncho to protect their clothing, this won’t help your equipment (or your shoes). You therefore need to be prepared. 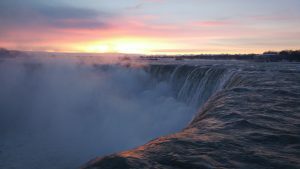 As well, if you’re been reading Niagara Falls’ vacation tips and heard people rave about the Journey Behind the Falls tour, you should add this to your itinerary. However, note that it’s possible for your camera equipment to get splashed during this experience, too. While you see the natural wonder from behind, you are close enough to hear it thunder, and splash-back is a distinct possibility. Because you don’t want to irreparably damage your priceless equipment — not to mention jeopardize participating in other Niagara photo-ops — because some water seeped in to the intricate tech, do your research on the best gear for these situations. For example, look into waterproof camera options. Plenty of companies sell inexpensive disposable waterproof cameras that can even go fully underwater without experiencing damage. Alternatively, see if you can find waterproof covers for your high-end equipment if you really want the best pictures you can get. As for clothing, rain hoods are useful, but you will probably need something more comprehensive to be safe. No matter what you select, to preserve your experiences of the falls’ relentless onslaught, you’ll need to find something that won’t be easily damaged by the elements. When it comes to Niagara Falls’ photography tips, it’s also important to think about scope. The grand vistas around the falls will barely fit into your field of vision when you’re there, so capturing them with a camera is truly a feat. This is where having different lenses will help you out. Wide angle lenses allow you to include more of the scenery in your picture, and are available in a variety of sizes. To help you take better shots when photographing Niagara Falls this way, keep in mind that it helps if you make sure there’s something interesting in the foreground; you don’t want the image to leave the viewer’s eye wondering, searching for a focal point. If you like quirkier photos, you might bring along a fish-eye lens too. This ultra-wide-angle style can create really interesting shapes, distortions and compositions, and offers lots of creativity. A lens of this type will also make it easier to get an unusual perspective of the falls and the surrounding areas. Moreover, the curve of the lens might allow you to achieve a wider view of certain landscapes. Next, as with any location, taking top photographs in Niagara Falls is all about lighting. From the breathtaking pastels of sunrise, to the “golden hours” around sunset, and then the eye-catching, bright explosions of fireworks at night, there are plenty of opportunities for both amateurs and professionals to snap dazzling photographs. Because the middle of the day is bright and sunny though, and one of the worst times for taking travel photography, you might want to spend this time catching up on your sleep or checking out attractions which don’t need to be captured on camera. If you’re still using film cameras, you could consider purchasing a variety of film for the various lighting situations you will find yourself in on a trip to Niagara Falls. Remember that the color temperature of the film will affect how your subjects appear in different lights, and slower films can be better for taking pictures of Niagara Falls at night. Lastly, for some truly stunning photographs of Niagara Falls, long exposure shots often come out best. Work some magic by bringing along a tripod, and then leave the shutter open on your camera to snap pictures of the thundering falls over a long period of time. These types of photos will almost make you feel like you have captured the actual movement of the rushing water while you’re there. Better yet, make use of your tripod and a slow shutter speed to get a good look, in your photographs, of the lovely colors of the falls and the surrounding cityscape at night. They’ll shine even brighter using this technique. To ensure your luggage doesn’t get too heavy, it pays to take a lightweight travel tripod with you on your trip. With this device, you will also be able to more easily control your camera’s manual settings, and use advanced photography techniques such as focus stacking, HDR, and panoramas.